Didn't get enough shenanigans on the 1st? 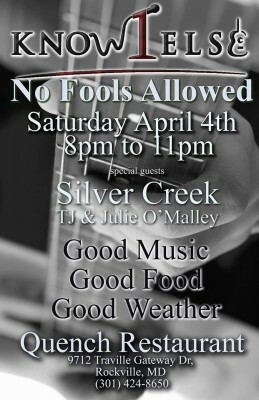 Come by for some musical mischief and spring break fun. 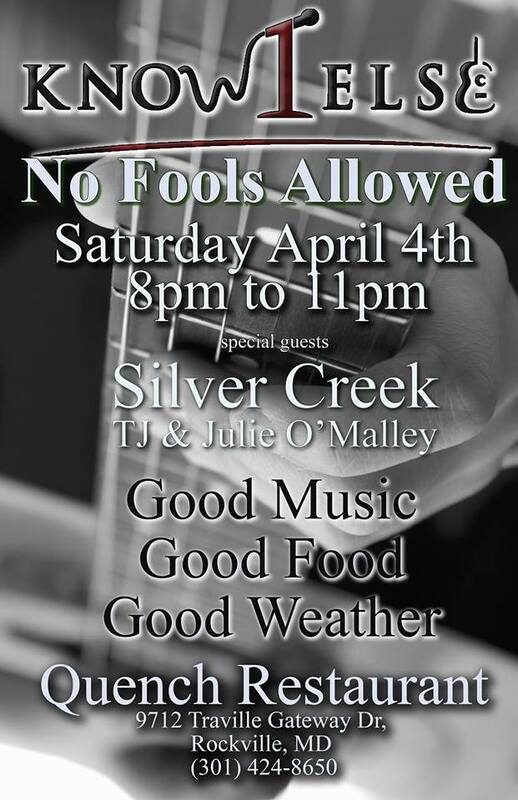 Special guests: Silver Creek (T.J. and Julie O'Malley). 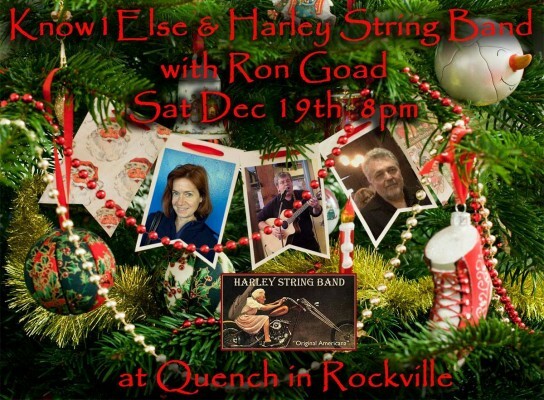 They've been active in the DC area music scene since the 1980s and present a lively musical mix with vocals, guitar, bass, and sometimes ukelele. Their music is country ragtime and honk-tonk, with added selections of folk, bluegrass, swing, classic jazz and country, and even some Hawaiian. Playing our Sunday Best, a night of Keating and Drinking. 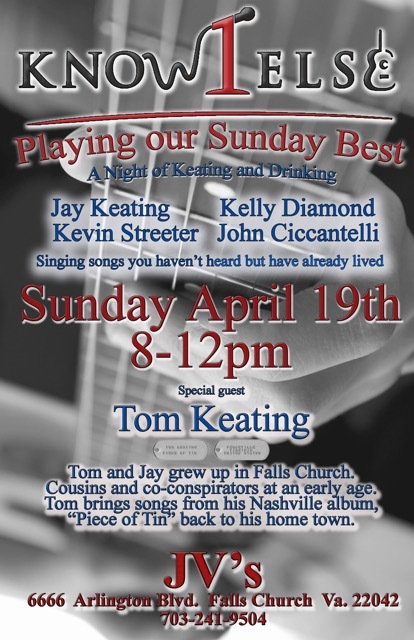 Know1Else with John Ciccantelli, and special guest Tom Keating (check out Tom's new album Piece of Tin). 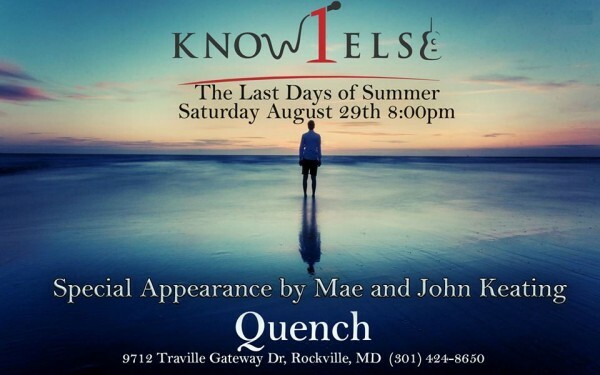 Third Wave Americana Band, Know1Else, will perform “The Night of the Book at FNDTN gallery and livespace in Kensington, Md from 8-10pm to kick off “The Day of the Book” festival, an all day tribute to books and their authors in Kensington on Sunday April 26th. Know1Else will present a literate, listenable, likable selection of songs you haven’t heard about things you’ve already lived. Cinco de Mayo is on a Tuesday? How is that gonna work? 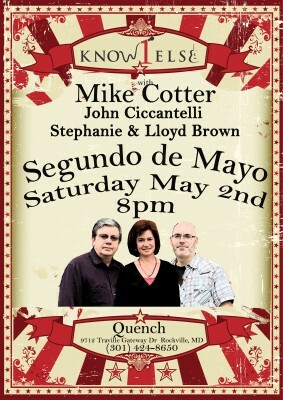 Well if you are a weekend warrior like us….you make it cinco days of cinco and celebrate on Saturday night at Quench where Know1Else and Mike Cotter will kick off your Cinco de Mayo celebration with 3rd Wave Americana Music, first rate food and drink and fun second to none. Lloyd and Stephanie Brown and bringing their indie loving musical choices to Quench a second time. 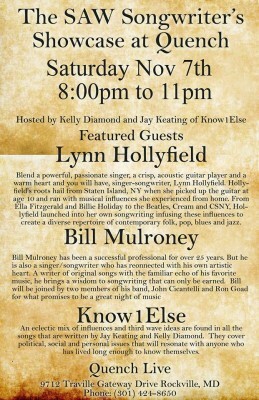 John Ciccantelli will be joining Know1Else on guitar. 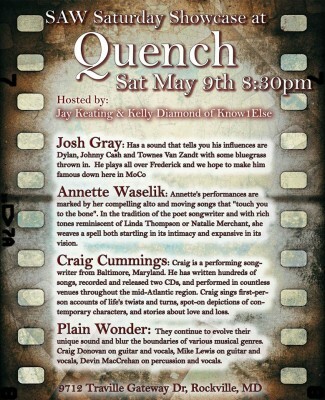 Spring is the thing at Quench! 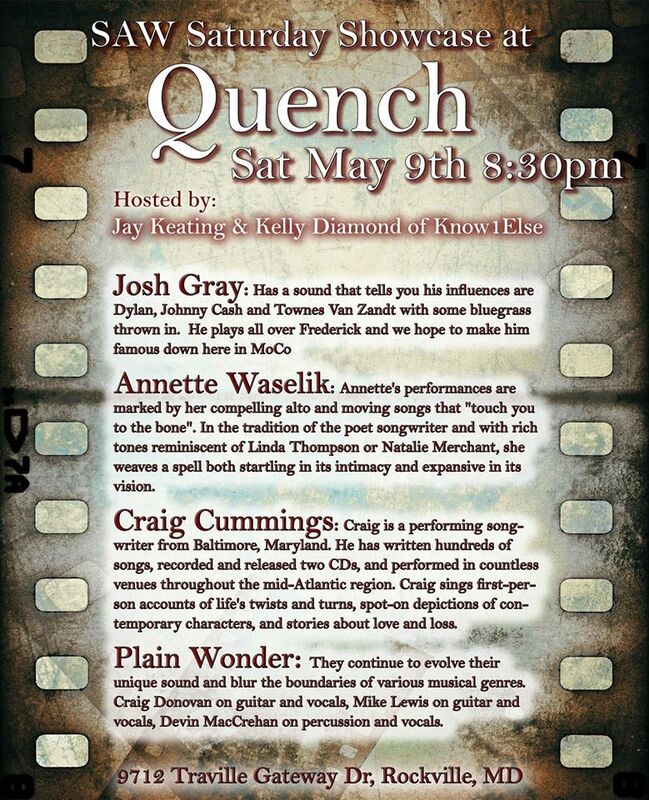 Know1Else is hosting another SAW (Songwriters' Association of Washington) Saturday Showcase. 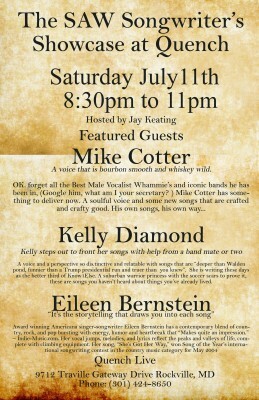 I hope the local community will help me support a Saturday night of listening music here in MoCo. 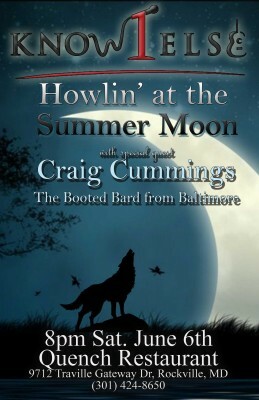 We have a great lineup of artists from across the spectrum and local map. — at Quench. 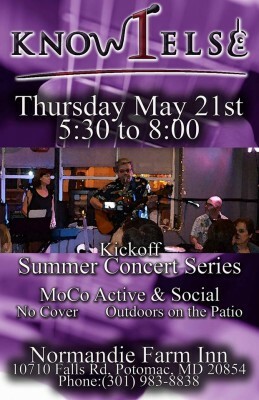 We are kicking of the summer with a bang. If you hate meeting people, having fun, socializing outdoors on beautiful spring days...call my therapist. But if those things appeal, call Normandie Farms and make a reservation. 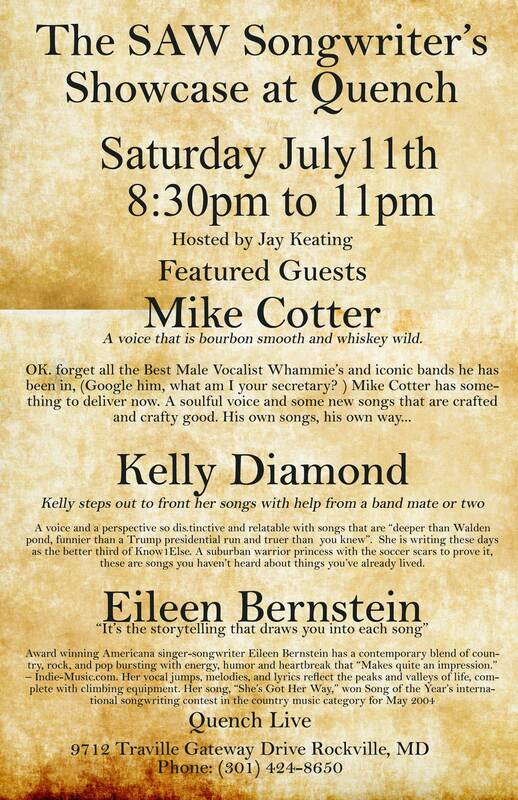 Mike Cotter, Kelly Diamond, and Eileen Zornesky Bernstein will perform a host of original songs and tell you a few stories about them. Know1Else is almost ready to dust the sand out of our shoes and look for a matching pair of socks to wear. But before that, let's give Summer one more yell. At Quench. 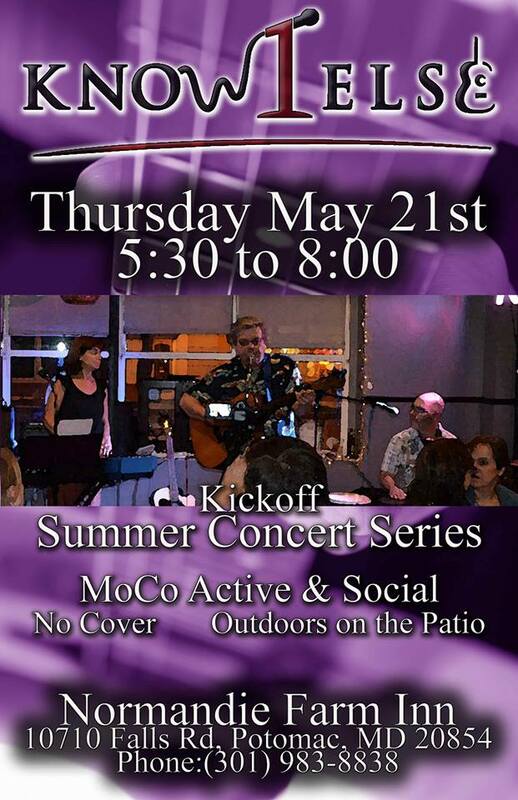 There is a rising tide of great songwriters of every age and SAW (Songwriters' Association of Washington) is there to give them the support and exposure they need. 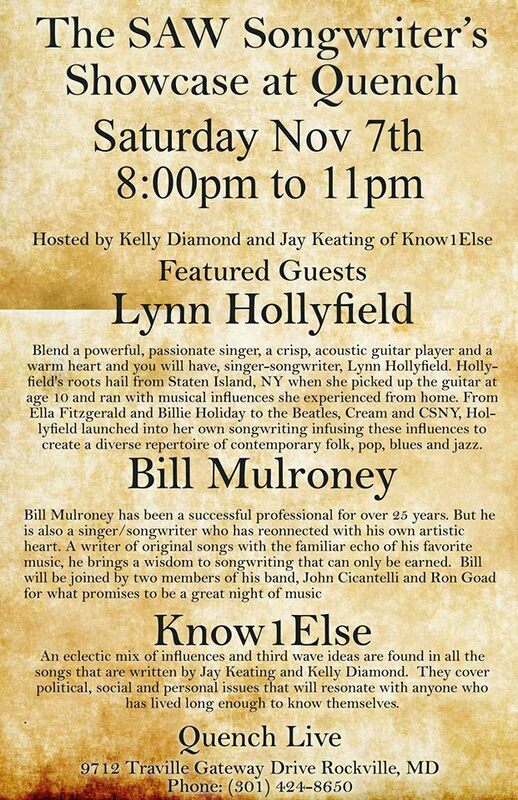 Come see what Lynn Hollyfield, Bill Mulroney and Know1Else have to say about modern life in your time.